Green Waste Removal | 1800-GOT-JUNK? When you need leaf collection or any other kind of yard waste removal, call 1800-GOT-JUNK?. 4. Once you say the word, we’ll haul your yard waste away from wherever they are located and finish by tidying up the area. Green Waste Disposal You Can Trust! As it relates to the environment, several laws have changed over the years. In some municipalities you cannot leave bags of leaves and yard waste for trash pick up. Some state laws are now banning yard waste from land fill locations, making it hard to dispose of yard waste easily. Leaves, grass clippings, twigs, mulch, and other yard debris can pile up in front of storm sewers and cause unnecessary nutrients to flow into lakes and streams. What can be done to prevent this? 1800-GOT-JUNK? is happy to help recycle your leaves and other yard debris. Green waste, also know as yard waste, is vegetative waste resulting from the care and maintenance of landscaped areas, lawns, and gardens. Yard waste includes leaves, grass clippings, brush, twigs, mulch, garden wastes, tree trunks, holiday trees and prunings from trees or shrubs. Many local rubbish services don’t offer yard waste collection, which can make disposal difficult. If you have yard waste you need to get rid of, call 1800-GOT-JUNK?. We’ll take care it everything for you and get those piles of yard waste out of your way in no time. You can call your local rubbish pickup service to arrange a pickup. This isn’t an option for everyone, since some areas don’t pick up yard waste. Those that do offer the service often have limits on how much they will take, so if you have large amounts of waste they might not be able to take it all. You can also take it to the tip on your own. You’ll need to make sure your local tip accepts yard waste, since some don’t. If you have a truck, it’s easy to transport your yard waste on your own, otherwise you’ll need to arrange a way to get it there. If you just don’t have the time or resources to handle your yard waste removal on your own, you can always call 1800-GOT-JUNK?. 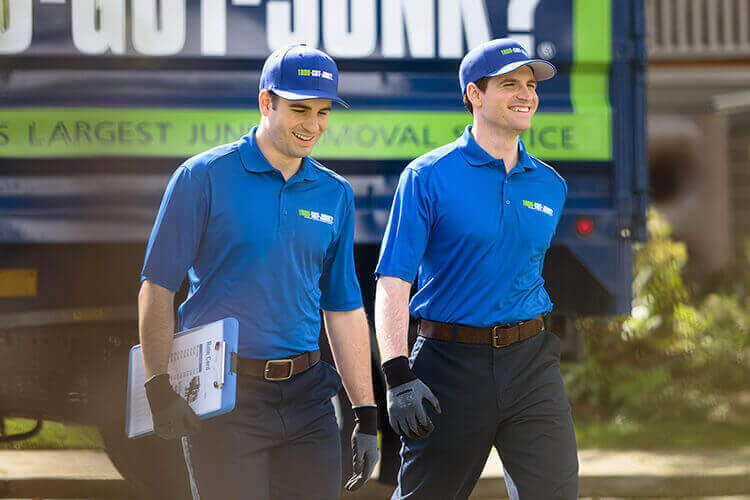 We’re a full service junk removal company, which means we’ll take care of everything for you. We’ll do all the heavy lifting and ensure that your yard waste is properly disposed of. Can I throw green waste (branches & leaves) in the trash? As it relates to the environment, several laws have changed over the years. In some areas you cannot leave bags of leaves and yard waste for trash pick up. Some state laws are now banning yard waste from landfill locations, making it hard to dispose of yard waste easily. Leaves, grass clippings, twigs, mulch, and other yard debris can pile up in front of storm sewers and cause unnecessary nutrients to flow into lakes and streams. If you need yard waste hauling, you can always call 1800-GOT-JUNK?. We offer full service yard waste removal and will take care of everything for you. We’ll get it out of your way in no time and will do our best to ensure it is recycled or properly disposed of. Can you throw green waste in the trash? While homeowners may not realize it, leaves that build up on your property can slow down water run off during storms and can prevent water from reaching the soil if too many leaves are blocking the ground. Some cities have dedicated bin for leaves & yard waste however in many cases, you cannot simply throw leaves in the rubbish with other refuse. While leaf removal can be a bit of a chore, 1800-GOT-JUNK? has a responsible yard waste disposal service. After we remove your leaves, they will be mulched and composted to help protect and sustain the environment.